This Friday I will be reviewing Marc Jacob’s latest fragrance Bang Bang, so for the sake of continuity I thought it would make sense to review the original Bang fragrance, which in my opinion is the better of the two, but we shall get to that on Friday! Bang is Marc Jacob’s second masculine release after the eponymous Marc Jacobs for Men (the less said about that the better). It was released in 2010 to a lot of fan fair and positive criticism from the perfume blogosphere. Bang was a big launch for Jacobs, the fragrance was accompanied by a rather aggressive marketing campaign, which showed Mr Jacobs in all of his, ahem, glory. As you can probably tell from the notes list above, Bang opens with A LOAD of pepper, and normally I would describe most pepper notes as ‘nose-tickling’ but that would not be appropriate for Bang, instead I have opted to use the term ‘sneeze-inducing. So, Bang opens with A LOAD of sneeze-inducing pepper, it is intense and as my scented partner in crime Nick (from g & t and that and Fragrant Reviews) would say, the pepper note is ‘photorealistic’ – it is exactly like smelling freshly crushed peppercorns. If you don’t like pepper then Bang really won’t be for you, it is all about pepper for a very long time. Only after an hour or so do the other notes start to kick in, the elemi adds a cold metallic tinge that works with the pepper to stop it from becoming too foody, Bang certainly isn’t a gourmand. Other than the initial big bang of pepper, Bang is a relatively quiet fragrance, it wears very close to the skin and has quite a short life span. It is not the type of fragrance that screams ‘Bang’ but you will get whiffs of it every now and then throughout the day. It’s a fragrance that I find myself reapplying every now and then, just for those fun peppery top notes! As the pepper and the metallic weirdness wears off Bang becomes colder and more woody and a subtle note of vetiver starts to peek through the pepper. I really enjoy the cold, metallic woods in the base, it’s a nice contrast to the warm spicy opening, this is a scent that really develops. There is patchouli in the base but I don’t find it that prominent, unusually for patchouli, it seems to hide in the background. Bang is one of the best designer masculines available, and although it may not be entirely unique (there are a few similar niche fragrances out there), it is exceptionally well done. I don’t wear it often but my boyfriend does and on him it smells absolutely awesome. The Bang flacon is a large chunk of silver metal that has been stamped with the ‘Marc Jacobs Bang’ logo, the side is smoked black glass. 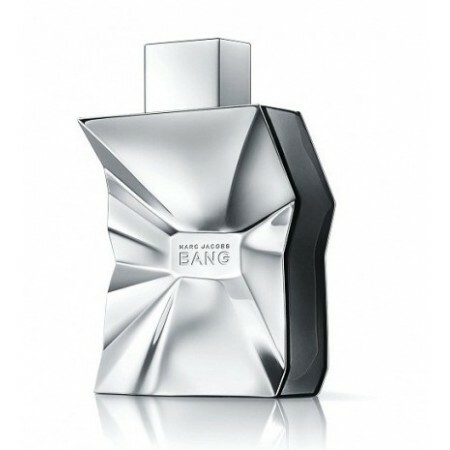 As far as masculine perfume bottles go, Bang is one of the most eye-catching and impressive, my only grumble would be that because it’s slightly top heavy it tends to fall over quite a lot, the 100ml bottle is especially unstable. Other than that it get’s a thumbs up from me! Bang is available in 30ml, 50ml and 100ml Eau de Toilette and prices range from £31 to £41. It can be purchased from most department stores and online retailers. Matching body products are also available. This review is based on a bottle of Bang from my own personal collection. Posted in Marc Jacobs, Masculine, Perfume Reviews, Woody and tagged 2010 Release, Bang, Marc Jacobs, Masculine, Metallic, Pepper, Woody. Bookmark the permalink. I really like Bang. It’s kind of impressive in all that it embodies. The pepper, the name, the *bang* of the logo as you pointed out on the bottle. Nice observation there from Nick about being “photorealistic.” Very much see that now! It’s well done right from the concept, through to the bottle and most importantly the juice! I do like the perfume itself (well, not on me but on my vSO) but I do not like either a bottle or their ad campaign (and especially the latter). Will it prevent me from buying a 30 ml bottle (the size is a definite plus for the brand) when they hit discounters? Probably not. The ad campaign is a bit ‘in your face’ isn’t it? I’m surprised that you don’t like the bottle, it’s pretty funky! It’s definitely a scent that is nice to smell on others. The fragrance itself is one of the best recent designer releases IMHO. Very gentle use of pepper, I am sure there is something floral lurking in the heart. Love it! I think you’re right there, there is most definitely a degree of ‘look at my new, shiny, thin, drug free body’, well Mr Jacobs, I guess if you’ve got it, flaunt it.